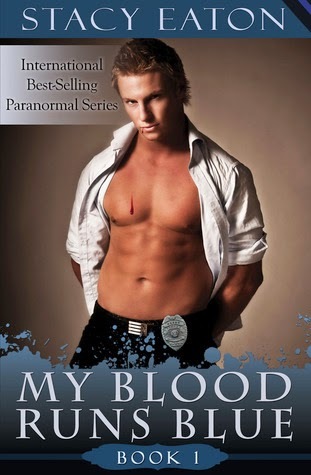 TBQ'S Book Palace: [Pat's Review]: "My Blood Runs Blue"
[Pat's Review]: "My Blood Runs Blue"
Officer Kristin Greene has always felt that something was missing from her life. Even though her job with the Fawn Hollow Township Police Department keeps her busy, she continues to feel as if there is something else out there she is meant to be doing. Kristin finds herself investigating a homicide where a young woman has had her throat ripped brutally out. As she begins to dig for the answers, she finds herself thrown into a world she never knew existed. When Julian and Alexander crash into her life, she finds herself being pulled into a love triangle that has been going on longer than she has been alive. Kristin in determine to figure out who they are and why they keep calling her Calista. Join Kristin as she fights to learn the truth about the recent murder, the two seductive men who have entered into her life and the real truth about herself in a suspenseful tale that weaves paranormal into to the realistic world of law enforcement. This was a very exciting book, but would be hard to put in a specific genre. It's about a policewoman, it has vampires, romance, re-incarnation, and oh yes...a serial killer. Kristin, our heroine, is a cop in the small town she grew up in. She was married to the love of her life, until he was killed in the line of duty. Now, a widow, trying to put her life back together. She is assigned to investigate a horrific murder which sadly turns out to be a young woman she knows. Even more intriguing is that the victim had her throat savagely ripped open. Not a knife wound! Enter VMF. To the human world, it stands for Virtual Military Force Security. To the Vampire world, it is Vampire Military Force. Alexander is the leader, and one of our Hero's. When he hears of the murder he assigns Julian, one of his enforcers, to investigate what sounds very similar to a series of crimes that occurred years ago. Julian knows these crimes well, he lost his wife and five year old daughter to the murderer. Julian is our second Hero. What follows is a series of events that makes the reader anxious for every twist and turn as it occurs. It doesn't end with your usual HEA. It ends, leaving the reader wanting more! Lucky for us there is more! Blue Blood For Life will hopefully have the rest of the answers we are looking for! I would recommend this novel to anyone who likes a stretch to their imagination while reading! Pat received a copy of this book from the author through World Literacy Café (last year) in exchange for her honest opinion. Thanks for the review, Pat! :) I've put Stacy's books on my list! Stacy will be on the blog June 13th with an interview! Have you read Stacy Eaton before? Do you have a favorite book of hers? Thank you Pat for your great review - and also to The Book Queen for allowing me to visit your blog! I look forward to coming to visit on June 13th - not only to celebrate my newest release, but my birthday too!. :) I'll bring the cake and streamers!